Hisense: "Together stronger through BIM"
Megens Installations: Well measured, well made. Achieving an improved construction process with minimum clashes and failure costs. 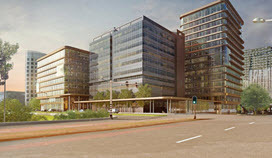 That was the goal of implementing BIM at the New Atrium in Amsterdam, a drastic renovation and new development project. The project involved the phased renovation and extension of the existing Atrium building (anno 1976), incorporating a northern and southern tower measuring 10.000 and 16.500 m² GFS respectively, an underground, double-layered parking garage measuring15,000 m² GFS and 5,000 m² GFS commercial space. Transparency, flexibility and sustainability are key to the design and construction, whereby the installations play an important role. Models were very frequently exchanged via IFC, tells colleague and BIM modeler Roy Jonkman from ITR Projects BV. ‘The contractors consortium performed all clash inspections, after which any clashes and reports were shared via Docstream. We optimized a number of matters through this, including, for example, the electrotechinical engineering contractor, concrete supplier, lift supplier and facade supplier. We did this until one balanced and final design existed, which also served as the blueprint for the implementation. ITR Projecten BV uses Stabicad for Revit BIM software. Hardly surprising, according to Jonkman. ‘As we have been working very satisfactorily with Stabicad for AutoCAD for some years now, we decided to use Stabicad for Revit as well. The interfaces between both software packages are in fact similar, which makes the transition to change over significantly easy. This software combination therefore offers the unique possibility to exchange models via Stabicad Exchange. For example, I use it when I have difficulty in keeping up with technical drawing aspects. Then I simply draw the design in Stabicad for AutoCAD and then add all information into to the BIM model via Stabicad Exchange, which results in a complete design. Now that our BIM experience is growing – The New Atrium is our fourth BIM project – this option is becoming less and less necessary, but it was virtually indispensable for a smooth start-up. As part of your service and maintenance contract with Stabiplan, please feel free to ask all your user questions via our support site or contact our helpdesk. For support questions, please visit our support portal via www.bimme.com or contact our helpdesk. Do you wish to receive more information about one of our products? Or do you have a question or remark? Please leave your details and message via the form below and we will get in touch with you as soon as possible! Your question can’t wait? On the left you can find our contact information. Stabiplan has been leader in the development of Revit and CAD-based design software for installation technology in Europe since 1990. Our product Stabicad is multiplatform and is tailored to the local needs and wishes of the engineer. We have over 10,000 users and offices in Belgium, Germany, France, the Netherlands and Romania.